Location: Clearwater and Idaho Counties, Idaho, and Missoula County, Mont. Extends 155-165 miles in a northeast-southwest direction. The eastern terminus is the confluence of Lolo Creek with the Bitterroot River near the village of Lolo, Mont., which is about 11 miles south of Missoula at the junction of U.S. 12 and U.S. 93. The western terminus is Weippe Prairie, in Idaho. Ever a dim track through a primeval land, this rugged trail across the backbone of the Bitterroot Mountains is still essentially in wilderness country and is little changed from the days when the Lewis and Clark Expedition passed over it both en route to and returning from the Pacific. Since long before that time, the Nez Perce Indians had been traversing the trail annually as they passed back and forth from their homeland along the Clearwater River in north-central Idaho to their buffalo hunting grounds in Montana. And in 1877, during the Nez Perce War, the nontreaty faction of the tribe, pursued by Gen. Oliver O. Howard's troops, utilized the route in its epic retreat from Idaho into Montana. The trail is sometimes known as the Nez Perce Buffalo Road because of the early Indian use, though it was only the main branch of the road. At the eastern end, it forked into two main branches. One led southeastward to hunting grounds on Deer Lodge Prairie, between present Missoula and Butte; the other ran northeastward toward the Sun River-Great Falls of the Missouri area, another grounds. Only in the 1850's did a variation of the main section of the route come to be known as the Lolo Trail; to the Nez Perces it was apparently nameless, and Lewis and Clark called it only "the road." Finding the mountains that separated them from the Pacific impenetrable via the Salmon River, in August 1805 the two captains decided to head northward from the Shoshoni village in the Lemhi Valley to the difficult Nez Perce trail over the Bitterroots that the Shoshonis had told them about. From the latter, the explorers acquired as many horses as possiblefor food as well as for riding and packing. 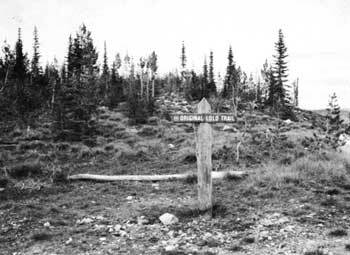 Between August 30 and September 9, guided by Old Toby, the expedition moved overland via the Lemhi and Salmon Rivers and likely through Lost Trail Pass to the Bitterroot River and thence to Travelers Rest campsite, near the eastern terminus of the Lolo Trail. The explorers took 11 agonizing days (September 11-22, 1805) to traverse the trailthe most arduous stretch in their entire journey to the Pacific. Battling rain, sleet, and deep snow, as well as hunger and dangerous mountain terrain, often hacking their way through dense underbrush and around fallen timber, gasping for breath in the rarefied mountain air, and eating some of their horses for sustenance, the half-frozen and thoroughly exhausted men trudged wearily onward. For some time, it appeared they might be stranded in the mountains or forced to turn back. To add to their woes, Old Toby, who had passed over the trail only once years before, strayed from the main branch along the high ridges and descended to the Lochsa River, a detour that added at least a day of travel. The situation finally became so critical that on September 18 the expedition separated to get out of the mountains. Two days later, Clark and a small advance party reached trail's end and met the Nez Perces at Weippe Prairie, where the main body arrived in another 2 days. The explorers, after resting and recovering, built canoes and on October 7 moved down the Clearwater River. The eastbound crossing of the trail, which took only 6 days, was much easier. The route was better known, and this time the crusted snow supported the horses. Nevertheless, the first attempt to traverse the trail on June 15-21, 1806, was not successful because of heavy snow and the failure to utilize Nez Perce guides. A successful, guided crossing was made on June 24-30. Another dramatic incident associated with the trail occurred in 1877. At that time, about 700 nontreaty Nez Percesmen, women, and childrencrossed it after the Battle of the Clearwater, Idaho. Resisting confinement to a reservation and seeking refuge, they moved into Montana to escape General Howard's slow-moving troops. The Indians were finally vanquished in September-October at the Battle of Bear Paw Mountains, Mont. Both the Nez Perces and the soldiers, in the Weippe Prairie-Lolo Pass segment of the route, passed over sections of it that had been converted into a crude wagon road by private contractors a decade or so earlier, in 1866-67. This never-completed project was carried out as part of a U.S. Government program to improve communications between western mining towns. After the Nez Perce War, the trail fell into disuse and gradually tended to lose its identification. But, threading through a jumble of ridges, ravines, mountains, thickets, and gorges, it had never been well defined and changed slightly from year to year as trees blocked certain pathways or as better local variations were discovered. To this day, many parts of the route have never been precisely located. 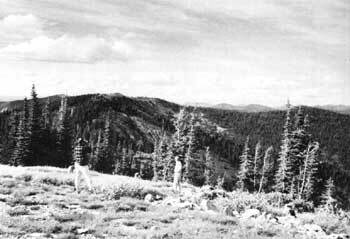 The longest section of the Lewis and Clark pathway that can still be indisputably identified, though considerable woodsman skill is necessary to locate it, is one about 6 miles in length, running in a southwest to northeast direction, between Rocky Point Lookout and Packers Meadow, which is a mile or so east of Lolo Pass. For most of its distance, the trail passes along the high backbone of the mountain mass between the north fork of the Clearwater River and its middle fork, the Lochsa. Along the stream courses, cascades and rapids make the river gorges impassable by boat, and the steep rock walls of the gorges prevent the establishment of practical foot and horse trails. The eastern part of the route is in Lolo National Forest, Idaho-Mont., and the middle and western parts in Clearwater National Forest, Idaho. What is called the Lolo Trail today is a steep, dirt fire-access road, constructed by the U.S. Forest Service in the 1930's that generally follows a large portion of the historic trail. Steep, narrow, twisting, and blocked by snow except for parts of July and during August, the road is ordinarily suitable only for trucks and four-wheel-drive vehicles. It runs from the vicinity of Powell Ranger Station, Idaho, on U.S. 12 about 12 miles southwest of Lolo Pass, to Pierce, Idaho. Its western portion runs north of the old trail, but its central and eastern portions closely conform to it. Many of the Lewis and Clark sites that lie off the road can be reached only on foot or horseback. U.S. 12, called the Lewis and Clark Highway, today parallels the historic trail, but for the most part runs south of it. From Travelers Rest wayside near its eastern end, the highway closely follows the Lewis and Clark route up Lolo Creek, passes the Hot Springs, crosses Lolo Pass, and just west, or south, of the pass skirts Packers Meadow. The explorers' route is picked up again at Powell Ranger Station and traced downstream for about 4 miles, where the two captains and their men climbed out of the Lochsa gorge by a spur ridge (Wendover Ridge) of the main mountain mass. From this point in the Lochsa gorge, the highway runs along the river down to Kooskia, Kamiah, and Orofino, Idaho. Then it generally conforms with the Lewis and Clark route on to Canoe Camp and thence along the bank of the Clearwater River to its junction with the Snake at Lewiston. An interesting feature along the highway is the Bernard de Voto Memorial Grove of Cedars, on Crooked Creek about 5 miles east of the Powell Ranger Station. This memorial commemorates the author of various works on the Lewis and Clark Expedition. The U.S. Forest Service, which interprets the trail under a cooperative agreement with the National Park Service as part of the Nez Perce National Historical Park, has placed markers at various points dealing with Nez Perce prehistory, the Lewis and Clark Expedition, and the Nez Perce War.